X-Rite and its subsidiary Pantone LLC have joined forces with ColorPartner to help automate colour management for industrial inkjet applications. 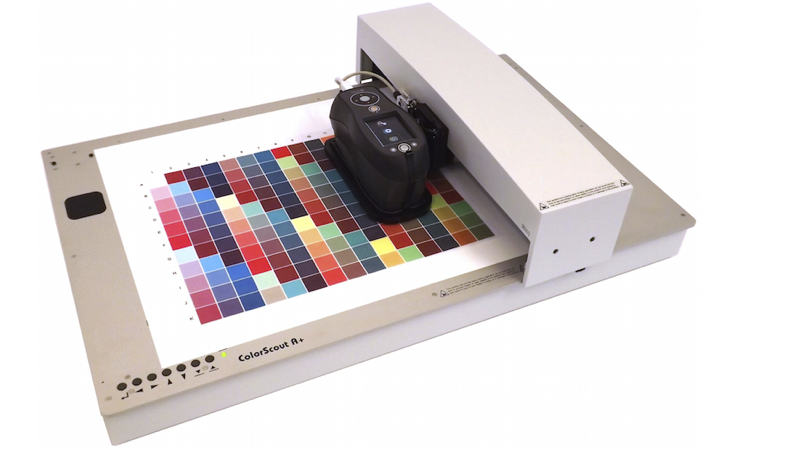 The new offering combines the ColorPartner ColorScout A+ automated colour measurement table and X-Rite’s Ci6x family of sphere spectrophotometers to enable printers to better measure colour on metallic, wood, plastic, ceramic and textured materials. The new Ci6X/ColorScout A+ solution will be made available through a variety of RIP manufacturers that support industrial inkjet output devices. “Inkjet technology makes it possible to print on a wide variety of materials, opening up new opportunities to industrial and commercial printers from fast fashion to flooring to packaging to home décor,” said X-Rite vicepresident Jan Keller. As the market moves to greater use of industrial inkjet, there is a growing need for an automated measurement solution that can quickly measure color across flat, textured and reflective surfaces. The 45/0-based measurement devices used in graphic arts applications are ideal for smooth or matte surfaces but have limited capabilities for textured or reflective materials. The Ci6x/ColorScout A+ solution, in A3+ size (other standard sizes: A2+, A1+; others on request) accommodating materials up to 515mm by 310mm (20.3 x 12.2 inches) and up to 30mm (1.18 inches) (60mm (2.36 inches) optional) thick, is ideal for measuring color on surfaces that do not perform well with a 45/0 spectrophotometer. As a sphere spectrophotometer, the Ci64 can accurately measure smooth, matte, reflective or uneven surfaces such as metallics, special effect finishes and textures commonly used in industrial inkjet applications from small label printing to LFP. Integration with color RIPs through X-Rite’s software development kit (SDK) will enable better color calibration and profiling of industrial inkjet printing and deposition solutions.